We record our family heritage using Family Tree Maker software, and have published our list of ancestors and descendents on-line if you wish to research further. Are you in our family tree? Are you researching your roots? Anthony LeCompte, or Antoine LeCompte, a native of the province of Picardy in France, sought refuge in England during the rule of Richelieu. He served in the English army earning military distinction and royal titles. Anthony sailed to America as early as 1654, and later married a French lady, Ester Doatloan, in London, and settled in America on what is now known as LeCompte's Bay off the Choptank River on the Eastern Shore of Maryland near Cambridge. The estate is still known as Castle Haven and looks over LeCompte Bay and LeCompte Creek. The LeCompte family has a rich history on the Eastern Shore of Virginia including E. Lee LeCompte, Maryland's first State Game Warden who is discussed in James A. Michener's book Chesapeake. "The Lord Feeds the Raven"
Robert Adams, who in 1620 was a member of the first House of Burgesses in Virginia, is the earliest recorded American ancestor of Kirk's great Grandfather, Thomas Tunstall Adams. It is not known whether he came direct from England or is a descendant of an earlier William Adams. Regardless, the American arm of the Adams family is usually traced to Sir John Ap Adams of Somersetshire and through his wife back to William the Conqueror. Robert Adams's great grandson, Captain Robert Adams, Jr. married Penelope Lynch, sister of Charles Lynch of Lynchburg, Virginia fame. Many descendants of Robert Adams have served as mayors, governors, and other elected officials of Virginia as well as generals and other officers in the American Civil War. Nathaniel Floyd, and his brother Walter arrived from Wales in Jamestown, VA in 1623 on the vessel "Bona Nova." They likely made frequent trading trips to and from the Old World until they and their offspring settled more permanently in Isle of Wight County and Accomac County. A relative, Richard Floyd, also came to Jamestown in 1653 and moved north to Long Island and is the likely ancestor of William Floyd who signed the Declaration of Independence. Nathaniel is the ancestor of another William Floyd, the progenitor of the Virginia-Kentucky branch of the family. William of VA married Abadiah Davis, a grandaughter of Princess Nicketti who was in turn a granddaughter of Chief Powhatan. Abadiah along with her sisters and brothers are the ancestors of many famous Americans including Governor John Floyd of Virginia, Sgt. Charles Floyd and Sgt. Nathaniel Pryor of the Lewis & Clark expedition, and many more including the Venable, Burke, Cabell, and Shelby families. Michael Stano, Cathy's paternal great-grandfather, was born in what is now Slovakia and immigrated to America in the late 1800's. He and his brothers Adam and Matej are the first of the Stano family in America, settling in New Jersey and Pennsylvania. Michael Lengyel, Cathy's maternal grandfather, was also born in what is now Slovakia and immigrated to America in the early 1900's settling in New Jersey. Michael married Helen Kozar, also from Slovakia. 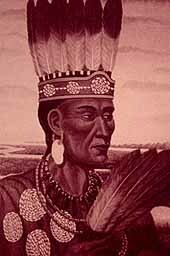 Wahunsonacock Powhatan , the father of Matoaka (otherwise known as Pocahontas), oversaw a loose empire of tribes around the Chesapeake Bay area in what is now Delaware, Maryland, and eastern Virginia. In 1607, the Virginia Company of colonists encountered Powhatan's tribes both peacefully and at odds. The encounter with John Smith that spawned the Pocohontas story is mostly myth, but exemplifies the best and worst of that early meeting of cultures. Chief Powhatan was coronated Emperor of Virginia by King James, but when he died in the spring of 1618, the succeeding generation would see their native lands usurped by the colonists. Powhatan purportedly had many children, most unrecorded. It is believed that we descend from his youngest daughter, Cleopatra, whose daughter Nicketti married a Scotsman named Hughes, and their daughter Mary Elizabeth married Nathaniel Davis. Hugh Mason and his wife Hester arrived from Ipswich County, England on the Francis in 1634 and settled in Watertown, MA (on the land that is now bordered by School and Grove Streets in Belmont). Elected freeman for a total of 29 years, Captain Hugh was very active in town affairs, serving as Town Clerk and Treasurer of Watertown. He and his wife are buried in the old cemetery there. The descendants of Hugh and Hester are many, and their efforts are marked by many developments in Cambridge, Watertown, Sudbury, and Concord. We descend from his son Joseph whose progeny later moved to Baltimore, MD. Kirk's great-grandmother was Mary Ann Westbay Mason. Curiously enough, we onced live near Estabrook Road - a road named after the family of Rev. Joseph Estabrook who married Captain Hugh's daughter Mary. John Clark, born in England about 1630, is the grandfather of Captain Christopher Clark, who married Penelope about 1709, and resided in Louisa County, VA. Their daughter Sarah, married the immigrant Charles Lynch and had a child, Penelope Lynch, who married Robert Adams, Jr. Captain Christopher and Penelope also had a son named Micajah Clark who married Judith Adams, the sister of Robert Adams, Jr. Descendants of Micajah and Judith include Governor James Clark of Kentucky. Clark County, KY is named for that branch of the family. Orlando Jones, famed lawyer of Williamsburg, VA is the son of Rowland Jones, the first rector of Bruton Parish, and husband of Martha Macon. Many of the Macon/Jones family are buried in the chancel of the Bruton Parish in Williamsburg. Orlando is also the grandfather of George Washington's wife, Martha Dandridge, who is the great grandmother of General Robert E. Lee's wife. Orlando's g-g-granddaughter, Elizabeth West Anderson married Dr. Nathaniel Wilson Floyd, who is Kirk's g-g-g-grandfather who may have been named for his great-grandfather Nathaniel Davis whose wife, Mary Elizabeth Hughes, is the great-granddaughter of Powhatan, the father of Pocahontas. Whew...so much for six degrees of separation! 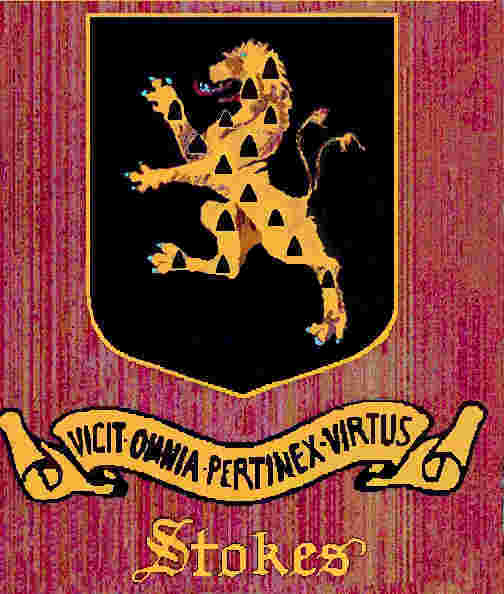 Christopher Stokes, the immigrant ancestor, was the second (non-inheriting) son of Christopher Stokes of Titherton Lucas and Prudence Ivy. Christopher (the son) seems to have loved the sea and was eager to follow in the footsteps of his uncle, Thomas Stokes, who had sailed off to Bermuda. Christopher had a brother named Thomas who married Elizabeth Young. Legend has it that Elizabeth financed Christopher's adventures to Virginia. Chris first appears in VA records around 1624 when his 5 year old son William gave testimony in court about poor little George Pope, who fell into a well. Christopher was elected as a representative of Warwick River to the House of Burgesses convened at Jamestowne October 16, 1629, and then elected again as representative from Denby in Warwick County March 1629-30. Christopher began hauling his whole family back and forth across the Atlantic in the process of acquiring land in the colony, and he eventually ended up with a goodly chunk of it in the Poquoson area of the peninsula. James Collie is the immigrant ancestor of The Collie Family of Pittsylvania County, Virginia. The Collie Family has its origins in the historic county of Moray, now called Morayshire, in northern Scotland. James Collie, was born there at the village of Garmouth shortly before July 28, 1718, the date on which he was baptized in the local Presbyterian church located about forty miles east of Inverness. Descendants of his great-grandson William Robertson Collie, still reside throughout Virginia. The Collie Family of Pittsylvania County, Virginia by Betty Cox Collie and Robert E. King, Ph.D.